Successfully Added DOOGEE TITANS2 DG700 Android 5.0 Rugged Smartphone - Quad Core 1.3GHz CPU, 1GB RAM, 4.5 Inch IPS OGS Screen, OTG, Smart Button to your Shopping Cart. DOOGEE Titans 2 DG700 Smartphone has just been updated so now it’s even better. You get the Quad-core 1.3GHz CPU, 1GB RAM and 8GB of memory, as well as that tough 4.5 inch 960x540 screen but now it runs Android 5.0 Lollipop for even more fun and extra flavor. TITANS 2 DG700 Rugged Smartphone, NOW with Android 5.0! 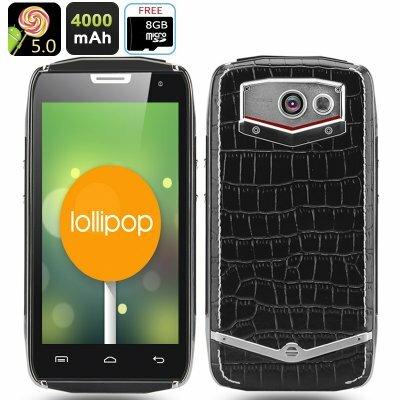 The DOOGEE Titans 2 was a God-like phone demanding attention for its adonis looks and rugged masculine body. It’s hard to improve on these qualities so DOOGEE kept the styling the same but to offer you a better experience they updated the Android 4.4 OS to Android 5.0 Lollipop. This brings you the latest offerings while retaining all the rugged charm and power of the Titans 2 with is luxury DOOGEE brand phone. The cool looking exterior of the DG700 with its crocodile skin inspired back, reinforced metal frame and rugged manly features means it’s up to the task no matter how rough you may get as its dust proof, shock proof and water resistant. It also retains that highly useful smart button, which can be programmed to give accesses to your most desired apps. Under the rugged exterior is the tried and tested 1.3GHz MediaTek MTK6582 processor along with 1GB of RAM, so it’s got enough grunt to handle normal tasks and most games making it a very capable device. You can also enjoy intelligent wake up and gesturing functions for easy call answering and usage. With the Latest Android 5.0 OS there’s much to explore and your mobile experience is more intuitive than ever before. The 4.5 inch screen offers up gorgeous images at 960x540 resolutions and with IPS and OGS technology, you can enjoy wide viewing angles and a great response to the slightest touch. A 5 megapixel front camera and 8 megapixel rear facing shooter will capture great shots of all that’s important in your life and with 8GB of internal storage there is more than enough space for even the snap happy photographer. To keep the DG700 running for longer is a whopping 4000mAh battery that means you get up to 12 hours of talk time so this is a great phone for the business person or entrepreneur who needs to spend many hours calling people through-out the day. You get two SIM card slots and these provide access to WCDMA/GSM bandwidths, which means you can easily manage two numbers through this one device for personal and business use. Thanks to the large battery and energy efficient operating system, you can enjoy using this devices for hours if not days without a recharge so if you forget your charger when traveling it’s not going to be an issue.